There’s nearly 60 known variations of the town and civil parish name, but Aylesbury is the one that’s stuck for now and it has its origin in Old English. “Fort of Aegel” is what the name was meant to mean, but who Aegel was is anybody’s guess. An Iron Age hill fort was found in the heart of the town which has been dated to the 4th century BC. Ancient Britons settled in Aylesbury and it was a stronghold of sorts for them. In the Anglo-Saxon era it was a significant market town. 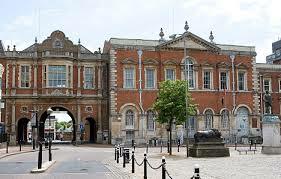 When the Domesday Book was written Aylesbury was categorised as a royal manor, the reason for that is that the king took the land for himself at the Norman Conquest. In the English civil war the town was also utilised as a stronghold by Parliamentarian forces. Aylesbury is unquestionably a beautiful place and it’s no surprise that there’s no shortage of history linked to its name, from famous individuals highlighted by statues, such as John Hampden, to the mysterious Aegel to which the town owes its name. The town today is as impressive as ever, with a beautiful mix of modern and historic architecture. And you don’t have to go too far from the centre of town until you’re at the beautiful rolling hills of the Aylesbury Vale. For a hog roast Aylesbury event, the town centre is most definitely the place to be. From the Queens Park Centre and the Waterside Theatre to hotels, to the best in pubs and nightclubs, there’s a mixture of venues which are suitable grounds for a mixture of events. The chefs onboard at Spitting Pig who’ve catered elsewhere will tell you how great Aylesbury is by comparison, whether it’s comparing venues or comparing clients and guests, the spirit of hog roast catering is a real match for the town. It really doesn’t matter how big or small an event may be or whatever the event is, whether is it is a wedding, private party or a corporate event I can guarantee that hog roast Aylesbury will be willing to cater your event. We recently catered at a private party for 90 guests at a lovely house in Aylesbury. We arrived at the location 6 hours before the serve time of 8.45pm in order to get the machine set up and get the hog roasting. 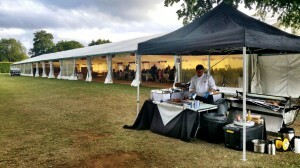 The garden where we set of provided the perfect backdrop for the event especially as the sun began to set and guests began to appear from the party, eager to get their hands on some succulent pig! Being a caterer in this area comes with its rewards, meeting great new people on a weekly basis and cooking hog roasts which brings a buzz and joy to any event, that’s one of the biggest things we enjoy in our hog roast Aylesbury jobs. On the same note because we’re a hog roast caterer with menu plans for all event types, it means that the events we cater and the people we meet and cook a hog roast for are never the same, the environment is always changing and that keeps us on our toes. From Friday to Sunday we could go from cooking a business breakfast for professional clients, to cooking for a party such as a birthday party, then on the Sunday we might be at a wedding offering a hog roast double-whammy – a hog roast reception and later in the evening a hog roast party buffet. We can help you with general event planning also, you might want some musical entertainment for the night but wouldn’t know where to start, or you may be planning your event outdoors and want to be sure nothing goes wrong so a marquee is a good idea in case it rains, in both cases or any other examples we can think of, we can lend expert advice so that you’re not left scratching your head. Our experience with venues and other services is invaluable. 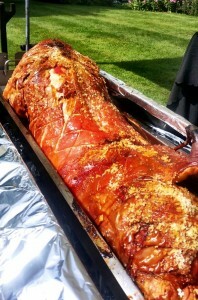 If you don’t need all that help and you’re comfortable doing things yourself then you might be interested in a service many of our other clients enjoy using which is hog roast hire Aylesbury. You’ll see why its so well liked once you see the hire page. To summarise what it’s all about, with hog roast hire Aylesbury a hog roast machine is put in your hands, and as the hog roast chef you can do whatever you like with the machine, the machines can cook just about anything but we’re sure you’ll think of something to spit or tray roast, or even to cook with the griddle. The machine hire plan is ultra enjoyable, if you don’t know what it’s like to hog roast cooking so much meat, whole meats especially, is a bit of a culinary ego trip, you’ll feel larger than life staring down at a large whole roasted pig, the food you plate up will put a smile on everybody’s face, and you’ll be smiling too with all the positive feedback you’ll receive. There’s a variety of hire details you can select from, if you’ working as a professional business in the same industry as ourselves you can choose to hire a machine, or numerous machines, for an extended period of time. The machines give a restaurant, takeaway or catering business a real boost.